As soon as you land at New Delhi’s International airport, our representative will meet and greet you on airport and transfer you to hotel. Stay in the hotel for remaining day and relax. Enjoy the dinner in your serene hotel room and relax on your bed. Enjoy a great breakfast served right on the first call in your hotel room. A welcome meeting will soon follow. A sightseeing tour of Delhi is organized, which would take you through Red Fort, Jama Masjid - India’s hoariest and biggest mosque, Raj Ghat - the resting place of Father of India – Mahatma Gandhi and several more. Enjoy the luncheon in a world class restaurant that specializes in classic Indian cuisine. In twilight, explore the hype and bustling life in this superb capital of Delhi. Return to your hotel. Enjoy the dinner in your serene hotel room and relax on your bed. Day 3 Delhi – Jaipur 258 kms / 5 hrs. Enjoy a great breakfast served right on the first call in your hotel room. 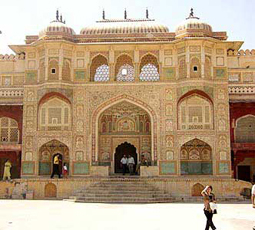 Subsequently, pack your bags and get ready for road drive in luxury car to Jaipur. The city of Jaipur also known as Pink City was designed in pink color for the purpose of giving a ceremonial welcome to Prince Edward – the Prince of Wales. Spend your day shopping around embroidery leather shoes, tie and dye fabric, blue pottery, Rajasthani jewelry, besides other exotic types of commodities. Return to your hotel. Enjoy the traditional Rajputana styled dinner in your serene hotel room and relax on your bed. Enjoy a great breakfast, served to you in a traditional way. You will feel truly refreshing as you gradually start discovering colorful sights of the city, the wonderful city palace, truly mesmerizing Palace of Winds or the Hawa Mahal, the imposing Amber Fort and the Jantar Mantar. Return to your hotel. Enjoy the traditional Rajputana styled dinner in your serene hotel room and relax on your bed. Enjoy a great breakfast, served to you in a traditional way. Check out from your hotel and head towards Agra through a comfortable road journey in a luxury car. Agra or Agraban, known during times of Mahabharata has 3 popular world heritage monument sites. This erstwhile Mughal capital was the hub of Akbar’s citadel. It was during his reign that many wonderful buildings. Return to your hotel latest by evening. Enjoy the traditional styled dinner in your serene hotel room and relax on your bed. Enjoy a great continental breakfast. Get yourself ready and pack your bags to drive to Taj Mahal –which puts forth true semblance of Love and Romance. Enjoy the Mughlai lunch in a popular restaurant. After lunch, you take the road drive to see Agra fort, Sikandra, Itmad-ud-Daula , and the ghost city of Fatehpur Sikri. Return to your hotel latest by evening. Enjoy the traditional dinner in your serene hotel room and relax on your bed. Enjoy a great continental breakfast. Soon start the road journey in your luxury car back to Delhi. Enroute, you take a brief halt to view the temple cities of Mathura and Vrindavan, the birth place of Lord Krishna, who is popular Indian deity, known for his Ras Lilas. Resume the road journey and you reach New Delhi. Get back to your hotel and pack your luggage. Our chauffeur will transfer you to International Airport, from where you can catch your forward flight to next destination.